Finally Mrs. Smith | Making the best of marriage, motherhood, and myself. This past week I tried out an adventure book titled “Myra Makes: Journey to Cloud City” and it was a hit! The book targets 6+ so my intention was to try it out with my 7 year old but once my 9 year old heard us he decided to join us, and that worked out perfectly. One because the activities can definitely be done as a team or split in half. Everyone started out by drawing a character to take on the adventure, giving them a name, and describing what they like on the back. Any other parents out there get a kick out of the names their kids come up with??? 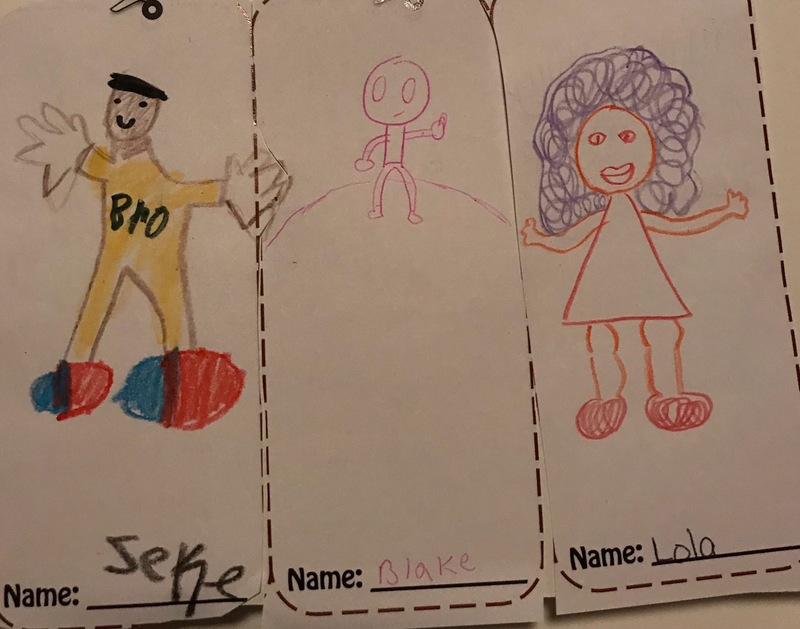 Okay so once the boys made their characters I decided to create one because come on…everyone knows adult coloring is therapeutic and who doesn’t need free therapy?! At this point my husband joins us and we begin the adventure. The first place we visit is the farmers market. The directions tell you to draw on the wagon five things you might find at a farmers market. As they began to call out random things I realized that my children have never been to one. Oh the shame!!! But I didn’t dwell on it I just made a mental note to add that to our summer bucket list. What I did do though is have a conversation about what a farmer’s market is and the type of things you can find there. Strawberry, lettuce, egg, grass,and an apple. Yep. I don’t want to give any spoilers but I will say this. My husband was quiet for most of the adventure until we picked up a few animals friends. One being an Impala, now my husband is with us but not in the book, so as a car salesman he instantly perks up cause he thinks we are talking cars. Now the boys are tickled because mommy has asked the age old question which came first, the animal or the car. It turned into a night of laughter as the Impala has a booth at the farmers market which my husband says is full of car necessities like oil, windshield wiper fluid, and gas…which is followed by more laughter. But don’t be fooled, there were some parts of the book that were very challenging to my boys, and there were other parts where we focused on working smarter not hurter. I enjoyed seeing their out of the box thinking and their practical thinking at work. I Loved that it hits all of the domains from math and science, to social emotional because though we aren’t always conscious of it, we want to teach our children to care about the wellbeing of others and their community. As someone in education I can say that this adventure nails the whole “process over product” piece. The book sparked conversation, teachable moments, and family time; it’s definitely something that I would recommend. I was excited when my boys came home and asked to work in the book over playing video games and I even went to work telling my coworkers about it. As parents we are our child’s first teacher and I was able to see where my children have grown and where they need to be strengthened all while having fun because of course “Play is the work of a child”. Stay tuned to my Instagram page for pics of our completed creations from this book. 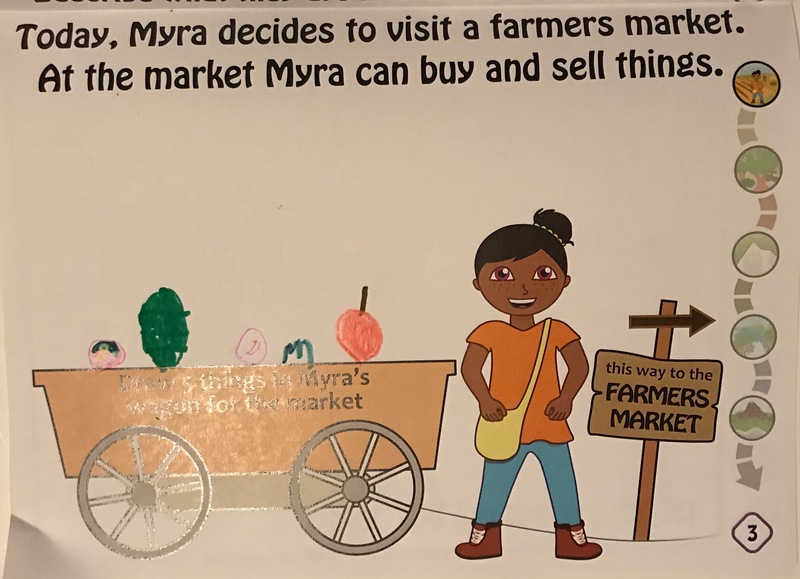 For anyone interested, Myra Makes is offering a free subscription, you can sign up (no credit card information or commitment) at here. Today I want to talk about forgiveness. We always hear that there is power in forgiveness and that it’s not good to seek revenge, blah blah blah. What I hadn’t heard though, was how to forgive. Now I am not going to sit here and say that I have the perfect solution but I will tell you what happened for me. First of all let me start by saying that I have had a problem with this person for at least 10 years. They repeatedly said some things that deeply hurt me and I never moved past it. I did confront the person but they denied it. I think it was difficult for me to move on because they never acknowledged their wrong. Any way I thought at one point I had moved past it because I was able to talk to the person and acknowledge their friends and family, and I was even able to speak to other people about them without being negative. But I noticed in the past few years that my dislike for them intensified. I’m not sure why, nothing had happened between us but suddenly I disliked them even more. In fact I was angry. This is a person I have to see on a regular basis so it wasn’t as easy as distancing myself, and I was seeing them even more thanks to social media and the ill feelings had turn into borderline hate. I started avoiding them at all cost, taking scenic routes so I didn’t have to speak or acknowledge that they exist. Blatantly ignoring them when I did have to cross paths and openly sharing with people that I was not a fan of that person whenever their name came up. I felt so ashamed. I would ask myself why I was feeling this way, especially when I didn’t want to. I asked myself if I was jealous because I know that emotion can cause people to behave irrationally but I wasn’t jealous. On top of that I REALLY wanted to like this person, to Love this person, to put this issue behind me. The thing was eating at me and every time I saw them they seemed unbothered and that frustrated me more. THIS THING WAS CONSUMING ME AND THEY WERE FREE TO MOVE ON! I started to talking to everyone I knew about HOW do you forgive someone. No one had a formula and that is what I needed. One person told me that they prayed on it for years and it just went away little by little till one day they woke up and it was gone. Another said they never forgave the person and the person died and now they feel like they will never be able to really move past it. But that didn’t help me; it inspired me, but it didn’t help me. Then one night I had a dream. I dreamed that I pulled the person aside and I told them that they had hurt my feelings. And you know what? THEY APOLOGIZED! Then they went on to say all the things I needed to hear (that I didn’t know I needed to hear) and I started crying, and smiling, and we hugged and went our separate ways. When I woke up I was still crying and I couldn’t wait to see this person because you know what? I FORGAVE THEM! So today I am free! I see the person and I can speak and I can share space with them and I have no ill feelings towards them. And you know what? There is power in forgiveness. I recently came across a company called A Wish For You. They specialize in sweet mementos and hand made cards striving to “make it easy to remember more people, more often, for less money in less time.” I don’t think it gets much nicer than that. So I browsed through the mementos with no particular person in mind until I saw it. You know how sometimes you see things that bring to mind certain people? Well that’s how this was, as soon as I saw the Herbal First Aid Kit I thought of a lady from my church who is always suggesting natural remedies and visiting sick members with baskets full of things to aid them with healing their ailments or relieving their symptoms. Contains six different healing delights. So with my gift and my recipient I had completed step 1. The next thing was to choose a card. Now these cards are the cutest noncommercial cards you’ve ever seen. It’s like someone hand sewed artwork onto them! And did I mention there is no extra charge for the card? AND SHIPPING IS FREE?!?!? Well..I’m mentioning it now. The last step is to create your personal message which has to be a little bit shorter than a tweet (115 characters). Voila! I completed my order on a Tuesday night and Friday I got a text saying “Thank you for my gift!” It felt so good to do something for someone who ALWAYS does for everyone else. It was my way of saying that the work you do doesn’t go unnoticed. And you know what? I feel good knowing that she may share my gift to her with others in their time of need. Almost a ripple effect. So for all the people who are into paying if forward or when you just want to surprise someone with a little something I encourage you to check out A Wish For You. From candles to paperweights there is a little something for everyone. Life is a stage. In the early parts of our lives we have many directors. They come in the form of parents, teachers, and coaches to name a few. They’re on the set telling you your part. They tell you what to do and what not to do, what your character’s morals are, the rights and wrongs of playing your part. Throughout the day there may be several settings; home, school, and your place of worship are the most popular. But as we get older there is a change in production and for some of us we find the lead role to be a lot of pressure. All of a sudden you have less people directing and a larger audience, which tends to be full of critics. There are a different set of people behind the scene that can help you “look the part” in the form of hair stylist, personal shoppers, and makeup artist, but, there are not as many people giving you cues and reminding you of your lines. Instead there is the audience with their constant feedback. In a sense you become your own agent, pitching yourself to potential employers and anyone else that has the say so on other parts that you would like to have. Sometimes the other cast members outshine you, and you find yourself in their shadow, or even replaced. Maybe your costar drops the ball, forgets their lines, then everyone is looking at you to save the show and not let the audience down. Now some of us are trying to rewrite our roles, we are tired of being type cast. But everyone knows how hard it is for an actor to be taken seriously in the music industry and vise versa. But it can be done. Anywho these were just my shower thoughts. Break a leg everyone. Why won’t people let me Love myself? Have you ever had someone point out something about you that is “wrong”? Something that you had never noticed, or at least not considered a problem. The same thing happened in high school. My boyfriend dumped me because he said he realized that I have hair on my face. I told him that he was crazy and that I didn’t have hair on my face, but after a long scrutinizing look in the mirror, I found the exact hair he was talking about and then started questioning why I look the way I look. But I am realizing now that I don’t want other’s to project their opinions of what is and isn’t beautiful onto me. It’s not fair and it’s not healthy. If I am feeling confident, and Loving myself as I am, who are you to tell me what I need to fix? As women there is so much pressure to look a certain way. It’s impossible to meet all the demands at once. Unfortunately, I believe these beauty standards will always be a part of our culture, and unless you move somewhere that your look is the ideal beauty standard, then you have to find your own way to combat it. For me that meant a couple different things. First I started limiting my social media time. I have no problem complimenting other women nor recognizing beauty in others but what I started noticing was that I was beginning to beat myself up for not looking like certain people or not possessing certain features that repeatedly showed up on my feed. Secondly I made sure to surround myself with others that were confident, uplifting, and practiced positive self-Love. It doesn’t mean they never had down moments but they had overall positive body images regardless of how their body was shaped. They also were comfortable talking about things they wanted to work on for themselves. Another thing I did was make sure I did things that made me FEEL good. I started keeping fresh flowers in my house, studying topics that interested me, and doing things that I enjoyed. Why? Because it made me feel good. When people ask me why? I simply say because I wanted to. Of course looking back I can tell you all of the witty and powerful responses I could have given to those individuals who chipped away at my healthy self-image but I’ll just keep you updated with any future incidents. My daughter recently turned 5 and, thanks to Facebook, I was flooded with pictures and memories of her birth. So for the first time since it happened I’m going to talk about my experience with the birth of my daughter. Long story short, she asked me when my period was due and I decided to buy a pregnancy test on my lunch break. So at my first appointment they gave me a due date of August 13th, based on my last period. Fast forward to a future appointment and they give me a due date of July 24. They said that based on her size I had to be further along. My two previous deliveries were cesarean so I knew my daughter would be the same. As my due date approaches they settle on delivering her two weeks ahead of her due date in order not to risk me going into labor on my own. Problem was, which due date are we using? So they decide to be safe they needed to test and see if her lungs were developed enough and that would determine when they would deliver her. So the last week in June, on a Friday, they perform an amniocentesis test (They stick a needle into my belly and into baby’s sac to draw out fluid). If her lungs are ready my c-section will be scheduled for Monday, if they aren’t ready then they will wait two weeks and test it again. The test shows that her lungs are not ready. We go home and prepare to celebrate the 4th of July weekend. July 3rd I am sitting at my grandma’s house ready to go get a second plate when I have a contraction. Nothing serious, braxton hicks I assume, except they are coming back to back. The doctor had instructed at this point in my pregnancy, which was considered high risk, that if I have 7 contractions in an hour I need to come into labor and delivery. I had had 11 in twenty minutes. My husband insisted we go to the hospital, even though I assured him it was nothing because there was no pain. We arrive to have the medical staff assure us that we are indeed in labor and because I had recently eaten we would need to wait 12 hours. I deliver her with no problem, they bring her over to me and explain that she is having trouble breathing on her own. That is all I remember before falling asleep. Now when I wake up it is well after midnight and I am surprised to still find visitors in my room. I honestly believe that my mind was trying to protect me because the events that followed do not make any sense. I thanked my friends for staying so late and asked them if they had seen the baby. I asked what her hair looked like, was it a lot or a little, straight or curly. But not once did I ask to see her. The next morning I wake up to see my husband and my mom in the room. The nurses do their thing and then I tell my family I am ready to see the baby. I get in my wheelchair and we head down the hall…and onto the elevator. This is why I say my mind was trying to protect me. WHY DIDN’T I PAGE FOR THE NURSES TO BRING THE BABY TO THE ROOM?!?!?! It was like somewhere in the back of my mind I knew. We arrived at the NICU, I showed my band, we did some password thing, and proceeded. It was like dead man walking. Everyone was behind me and the walls were filled with the photographic journey of previous NICU babies. Then we arrive at a little room protected by a curtain. A nurse opens it and greets me and I see this tiny baby sprawled out, with cords, tapes, wires, machines, and pumps; surrounded by more machines and noises and strangers…and then…she cried. And I looked around at my family with their tears and swollen eyes and I am overwhelmed. But I didn’t break until the nurse gave me permission to hold MY baby. The nurses carefully moved her wires and equipment and helped me to loosen my gown so that we could do skin to skin. The moment I held her against me she stopped crying. The nurses explained to me that she had a c-pap machine, feeding tube, an IV in her scalp, and some other devices that helped to monitor and maintain her vitals. I was devastated. I remember secretly telling my husband that I wasn’t being discharged without her and if that meant I had to hide in the hospital I would. I stayed in her room all day everyday until my nurses began calling down for me because my body needed to be tended to. Thankfully through it all I had lots of Love, support, and encouragement from my family and friends. One day the sisterhood president from my church called to check on me. I began to cry to her. She told me not to see my daughter as she was but to picture how I wanted her to be. That night I went to sleep with that thought on my mind. I dreamed that I was holding my daughter in my room and I kissed her on her body and said “Thank you Jesus” I then passed her to my husband who was on the couch next to me and he kissed her and said “Thank you Jesus” and passed her back to me. We did this over and over, kissing her in different places, thanking God, and passing her back and forth. I woke up still saying “Thank you Jesus”. It was four something in the morning. I called down to her room to ask her nurses how she was doing. The nurse told me “Actually it’s funny you called. She actually just knocked her feeding tube loose, but we are going to try and feed her and if she does well we will leave it off and see what else we can remove one by one.” I can’t tell you the smile I fell asleep with on my face. That next morning I went down to find her off of every machine and ready to nurse. My baby was on the road to recovery and doctors projected we could be discharged together, which we did. I recognize that my NICU story may not be typical, but I just want to give hope to other mothers out there, that their happy ending is out there. Hello everyone! It’s been a while but let’s jump into this Shipt review. If you follow me on social media you have seen my pics and coupons for Shipt, which is a subscription grocery delivery service. Shipt partners with different stores depending on where you are at. Some cities partner with Meijer, some with Kroger, Costco, Publix, etc. Your membership however travels with you. So if you subscribe in Ohio and rent a vacation house in Florida, guess what? You can still have groceries delivered. Any order over $35 gets delivered for free. The company boast that you can place an order and have it delivered within the next hour. Here’s how it works. 1. My Lists- here you can set up different shopping list to help you speed through the shopping process in the future. 4. On Sale Today- This is my personal favorite because hey, who doesn’t like a sale?! Okay you complete your order put in any special request or directions like park in the rear, or 1/2 pound of thinly sliced black forest ham. The app will also ask you your substitution preference (do not substitute, contact me, use best judgment) for your shopper to use in case the store is out of a particular item. Once your has been placed you will typically get a text from your shopper telling you their name, that they have begun shopping, and finally that they are on their way, and any in between regarding substitutions if you selected that as your preference. Lastly your groceries arrive and you receive a text thanking you for using Shipt reminding you that you can rate your shopper and tip them through the app if you’s like (you can also tip them cash upon delivery). Okay so the application process is pretty straight forward. You head to the website to apply, with a copy of your insurance card, you download the shopper version of the app, you do a phone interview (which consist of a question popping up and you recording a response), they do a background check, there’s some training videos and questions, and then BOOM if they like ya your in. They send you a starter kit which contains your Shipt shirt and Shipt credit card. Takes about 2 weeks. So within the shopper app you can put yourself on the schedule (in 1 hour increments up to a week in advance) and select the areas you desire to work in. Doing this will cause the app to notify you of orders giving you priority over other shoppers if you respond fast enough. Otherwise you can go into the app and look at the available orders and pick from those. 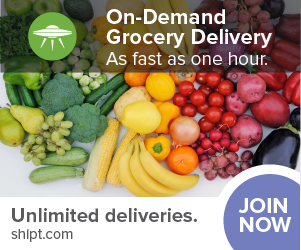 Sometimes there are orders that are nearing their delivery time and have not been picked up yet, for those orders Shipt will offer a bonus as an incentive for those who accept the order. The app lets you know the suggested time to begin shopping, how long it will take you to shop, and the estimated delivery time. Once you arrive at the store the order is broken down into categories (beverages, breads, pantry, household items, etc). It even let’s you know what aisle to find each item in. When in doubt you can scan the bar code on the item and the app will tell you if you have the right item or not. When your done you head to check out lane, remind them it’s tax exempt, swipe the card, sign, take a pick of the receipt in the app, type the total, and head to the customers house. The app walks you through all of your steps with reminder prompts and the directions to the house pop up to help you navigate. Once you have delivered the groceries you select the button that says order delivered and your done! On average I make about $17 an order. This could vary depending on what area you deliver to. 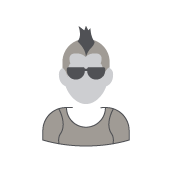 I have had a pleasant experience as a Shipt shopper and as a Shipt customer and would recommend them on both ends. Please comment any questions below and I will be sure to get back to you. If your interested in trying Shipt I’ve included a link to get $10 off your first order AND two weeks free. Simplify your life with on-demand grocery delivery. Get $10 in free groceries when you join with my link.